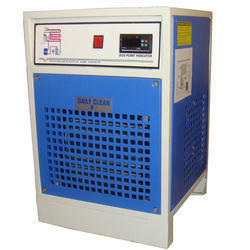 Providing you the best range of refrigerated air dryer and high pressure air dryer with effective & timely delivery. Leveraging on our industry experience, we have emerged as notable trader and supplier of Refrigerated Air Dryer. 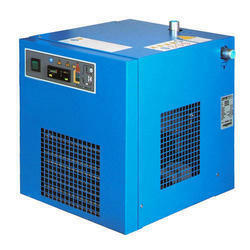 The provided air dryer removes moisture and contaminants by air chilling the air to a temperature from compressed air. Procured from the authentic vendors of the market, our offered dryer is manufactured using quality assured components and the latest technology by deft professionals who hold years of experience in the domain. Saturated compressed air enters to the Air to Air heat exchanger, where it is pre cooled by outgoing cold dry air. Highly effective pre cooler reduces the temperature considerably, and enables to use smaller 8. economical refrigeration system.Then the pre cooled, relatively low temperature compressed air enters to Air to Refrigerant heat exchanger. where it is cooled down to +3°C (Pressure Dew point). At this temperature , moisture in vapour form condensed to liquid form, and separated from the compressed air by moisture separator and discharged to drain port through automatic drain valve. The cold dry compressed air passes backto Air to Air Heat exchanger , and gain temperature by exchanging heat with incoming warm air. The dry air coming out from the dryer is ready to use for instrumentation and process air applications.